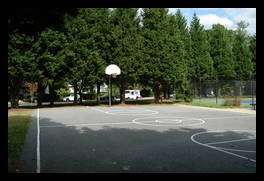 This neighborhood park has a playground, tennis courts, and a basketball court. 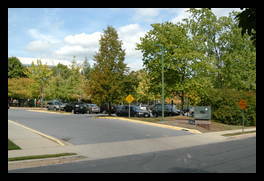 It shares a parking lot with the Leland Community Recreation Center and the Town of Chevy Chase government offices. 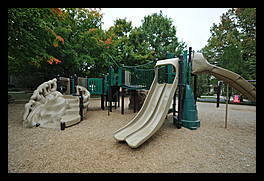 The playground was totally redone for 2009. 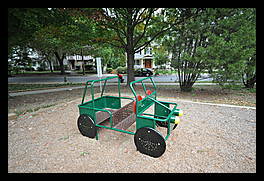 It has all new equipment including slides, stuff to climb on, and swings. 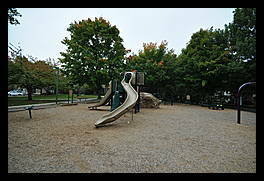 The whole playground area is covered with a thick bed of mulch. 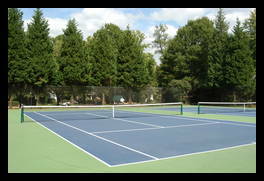 There are two tennis courts (no tennis practice wall though) as well as a basketball court. There are plenty of benches, but only a single picnic table. Attached to the park is Leland Community Center (4301 Willow Lane) It has a gymnasium, weight/exercise room (open to county residents, membership required), a social hall you can rent, an art room, and games such as table tennis billards, and air hockey. Straight slides 2 very good A steep but not too long double slide. Curved slides 3 very good One long curved one and a shorter curved double slide. Climbing apparatus 1 very good A fake rock to climb on, a bar to go across and ladders to climb. Bridges 1 good An intentionally wobbly. Wobbly seat 1 good I didn't try it, but what looks to be a wobbly seat, off by itself. Metal Car 1 very good A green, red, and brown metal car that you can pretend to drive in. It has two steering wheels.